I hope everyone had a wonderful Fourth of July! Last year we hosted over twenty people, grilled burgers and brats, had a fireworks extravaganza in the back yard and had a heck of a time. This entire summer has been spent with The Hubs and I traveling; however, our traveling has been separate and in opposite directions most of the time. We have managed to meet up in Dallas (where he was working and I was at a conference) and to spend some time with family prior to the holiday. A Fourth of July spent with just the two of us on the patio was the goal this year. Our quiet holiday also allowed me to complete the C.L.U.E task for this month. Cook, Learn, Undertake and EAT (also known as the C.L.U.E. Society) is a similar to the board game of CLUE. It involves secrecy, fun, challenge and cooperation with the other game playing members. But don’t be alarmed, there are no murders in our society. Each month our members receive the name of a food blog and a theme. We lurk and hunt through our assigned blog to find a recipe that we adore and that fits the month’s theme. I almost settled on Kathy’s Turkey Meat Loaf Sliders with Cranberry Sauce and White Cheddar and I was going to play up the whole “Christmas in July” theme. This recipe was still in my bag of tricks until the Fourth rolled around and I wanted something a little simpler (read less prep) to slap on the grill. What I found was a keeper of a recipe. 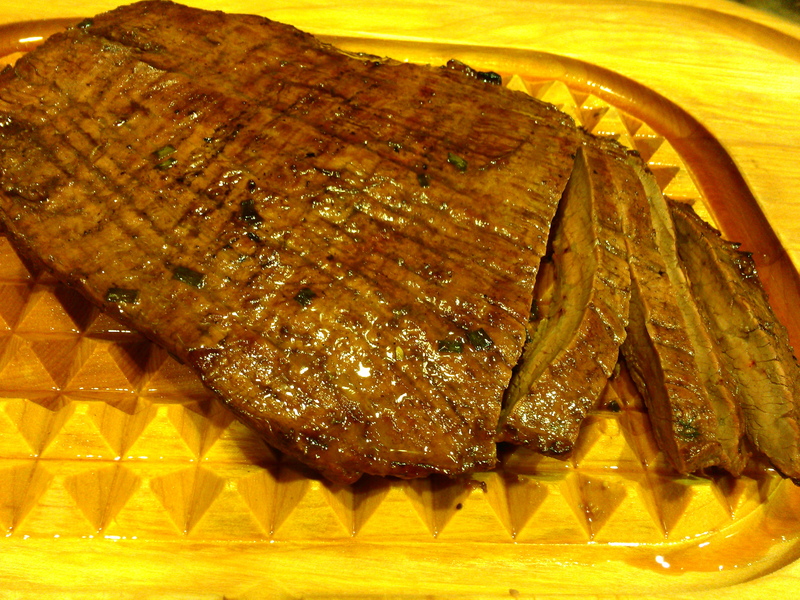 It is so good that Kathy has featured it twice on her blog: Marinated Grilled Flank Steak. Mix all ingredients in the pan in which meat is to be marinated. Marinate flank steak, turning occasionally, for 2 to 12 hours in the refrigerator. Cook meat over hot coals for 5 minutes per side for rare meat. Removed from grill and let set for ten minutes. Slice meat on the diagonal across the grain and serve. *I would make these items NON-optional. I used fresh chives and fresh chopped dill flowers. 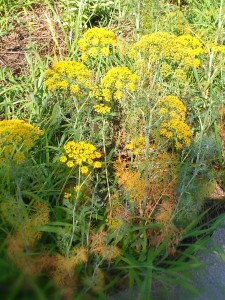 I threw in a dash of celery seeds. This really made the difference. The dill really came through in the finished product. 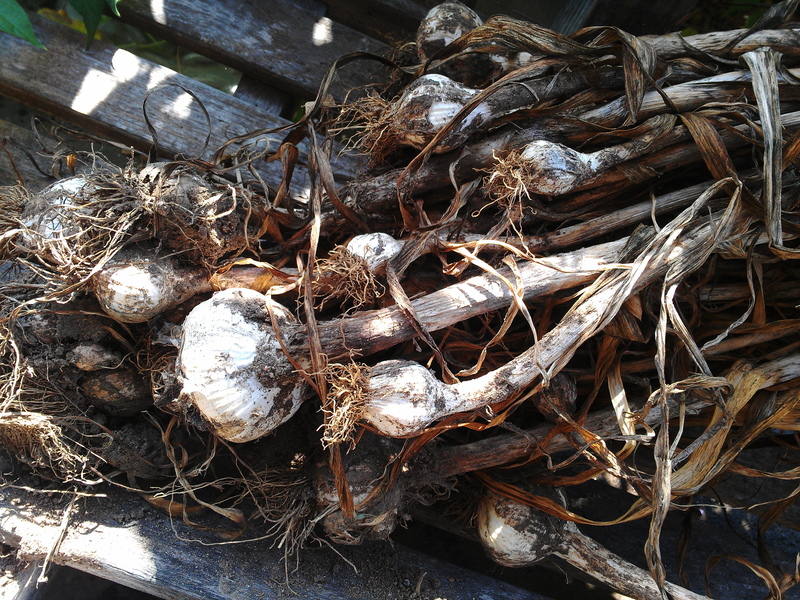 I used recently harvested garlic in the marinade. This marinade is delicious and I will use it on many other cuts of beef. Don’t mind the weeds—I chopped some dill flowers for the marinade, too. We had slices of the flank steak with grilled corn on the cob (slathered with sage butter), fresh watermelon, and a fruity drink (more about that soon.) It was a simple yet delicious meal. Thank you, Kathy, for a great marinade that I will be sharing with family and friends. To end today’s post, I would like to offer you this garden tip. Although I have many chives growing throughout the gardens, I love how they look in patio pots, especially when they begin to flower. I can also have chives throughout the winter as this pot is easy to move into the greenhouse. 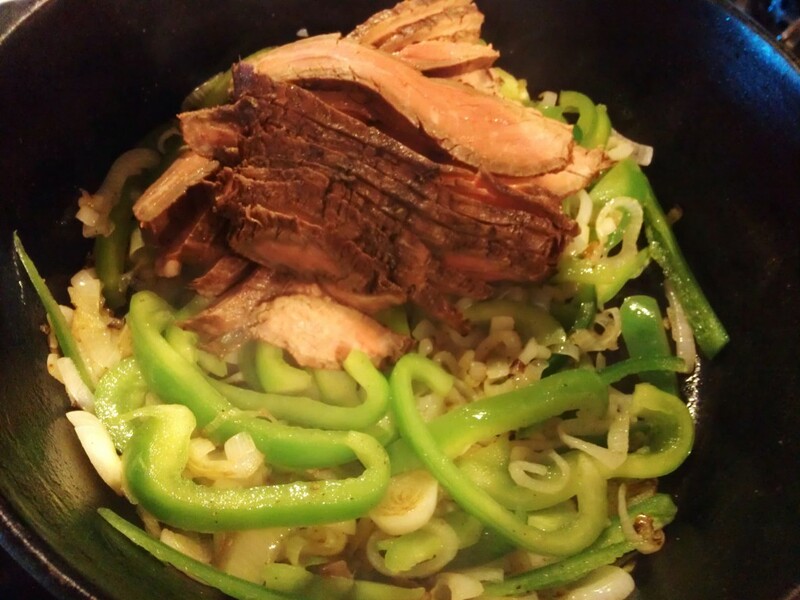 One final note: We enjoyed the leftover marinated flank steak as fajitas the next night! Please check out the other C.L.U.E. bloggers this month. 43 comments to Marinated Grilled Flank Steak for C.L.U.E. One of our favorite cuts to grill! What a great recipe! And I would agree with your non-optional comment, Debra! I’m sure those add a lot of flavor. I found that recipe so loooong ago! I am happy that you really liked it. We love it. I agree with you, I always include the optional items and it does make a difference. .It is perfect for flank steak. Love flank steak! So much flavor, and so nice on the grill. This is terrific — thanks. YUM! Marinated flank steak is one of my absolutely most favorite grilled items (right up there with ribs). It’s funny how seasonings end up being ‘optional’ but really aren’t, eh? What would a dish be without the flavor they add? That dill added some delicious flavor—so much so that I doubt I can make this again without it. My SIL just walked in with a flank steak asking what we could do with it. Now I know!! We were both on the same wavelength this month with our grilled beef and similar marinades. Your flank steak would be a huge hit with my gang—what a great pick for the 4th of July! It was a hit. Getting ready to check out your CLUE post, Liz. ok, this, your Spicy Baked Beans and a salad and you’ve got a wonderful Summer meal. Great choice. Pinned. I wholeheartedly agree, Lea Ann! Glad you liked the baked beans. It’s not a long comment, but it is heartfelt—YUM! This grilled flank steak would make my family quite happy…it looks amazing!! Great choice! I don’t know of any family that wouldn’t love this! I adore grilled flank steak and it is such a perfect BBQ treat. Love the marinade! Nice choice! I am not really a fan of red meat, but THIS flank steak looks just too good to miss in life, Debra. 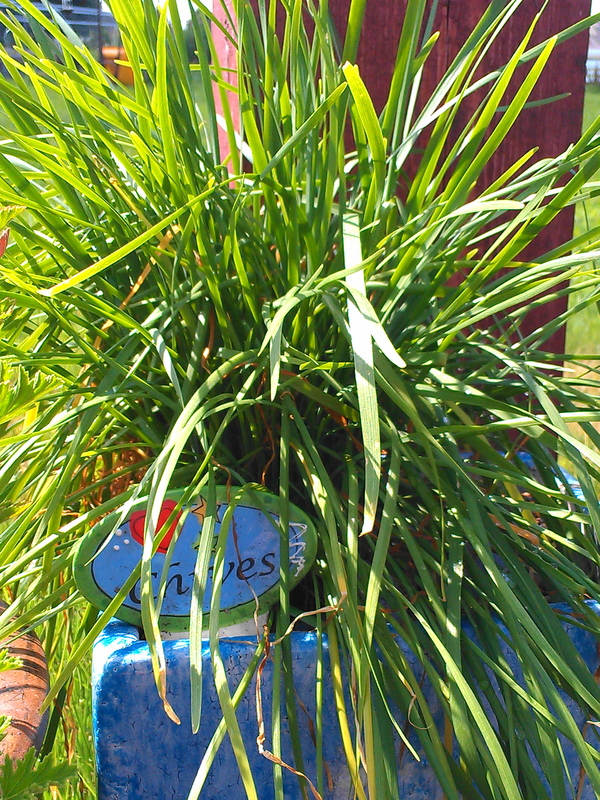 Healthy chives too! Your steak looks lovely Debra, for some reason I never think about flank when I am making steak. This recipe may change all that. Me neither, but it is a much cheaper cut. Going to utiliZe it more here, for sure. That sounds wonderful! Looking forward to trying it when I get a new gas grill (soon, I hope). Love those baked beans, too, at Lea Ann’s blog. I included my version of a famous Oklahoman quote in my comment there. Will Rogers, perhaps? I will check it out. Oh wow!!! Now that is one gorgeous flank steak!! This one has my dad’s name all over it. He’s going to love it! Safe travels to both of you… we have not travels this summer and though yours seem to be somewhat work related I’m still somewhat envious!! Hope your dad likes it. Doing a bit of “fun” traveling when we can. Marinated flank is one of our favorite grilled meats! Love this marinade! I do , too. It is great. So glad I found it and borrowed it from Kathy. My husband wouldn’t complain if this were served on the Fourth! Perfect choice! You always pick the BEST recipes 🙂 Can’t wait to try this one! !